When children have been removed from the care of their parents because of neglect or abuse, it is a traumatic event for the child and the parents. The number one factor to ease the trauma and stress of separation, preserve attachment, and increase the chance for reunification is the frequency and quality of parent/child visits. Family Connect Pasadena provides trained family visitation coaches to monitor visits between children and their parents in a physically and emotionally safe family friendly environment. This program was launched on February 14, 2013 using a redecorated interview room on the 2nd floor of the Pasadena DCFS office. 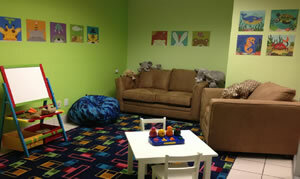 FCP repainted the walls, added comfortable furniture, a rug, pictures, books, and lots of toys----everything we could do to make the space warm and welcoming. In order to help more families and be closer to the families we serve, we have expanded to seven locations throughout the area: Pasadena, South Pasadena, El Sereno, Echo Park and Baldwin Park. These locations are in partnership with First United Methodist Church, Learning Works High School, Barrio Action Youth & Family Center, and Hillsides all of whom are committed to supporting healthy families in their communities. Volunteer to be a trained family visitation coach monitor, receive specialized training, and help families reunite. We are especially interested in bilingual volunteers who speak Spanish.